From the bestselling author of "Shadowmancer " comes an enthralling first title in a new series following three children--twins Sadie and Saskia Dopple and their friend, Erik Morrissey Ganger. This book is an "illustra-novella, " in which the story is told alternately in graphic novel format and plain text with occasional illustrations. - Publisher From the best-selling author of $lt;i>Shadowmancer$lt;/i> comes an enthralling new series of illustra-novellas. 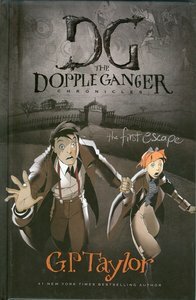 $lt;i>The First Escape$lt;/i> is the first book in the Dopple Ganger Chronicles, a six-book series following three children--Sadie and Saskia Dopple and Erik Morrissey Ganger. Sadie and Saskia are mischievous identical twins living at an orphanage, where Erik is their only friend. They are separated when Saskia is adopted by Muzz Elliott, a wealthy woman searching for her long-lost family treasure. While Saskia stumbles into the center of a crime only she can stop, Sadie and Erik embark on a quest to find her. This book is in an exciting new format called an "illustra-novella," in which the story is told alternately in graphic novel format and plain text with occasional illustrations. About "The First Escape (#01 in The Dopple Ganger Chronicles Series)"
From the best-selling author of $lt;i>Shadowmancer$lt;/i> comes an enthralling new series of illustra-novellas. $lt;i>The First Escape$lt;/i> is the first book in the Dopple Ganger Chronicles, a six-book series following three children--Sadie and Saskia Dopple and Erik Morrissey Ganger. Sadie and Saskia are mischievous identical twins living at an orphanage, where Erik is their only friend. They are separated when Saskia is adopted by Muzz Elliott, a wealthy woman searching for her long-lost family treasure. While Saskia stumbles into the center of a crime only she can stop, Sadie and Erik embark on a quest to find her. This book is in an exciting new format called an "illustra-novella," in which the story is told alternately in graphic novel format and plain text with occasional illustrations.